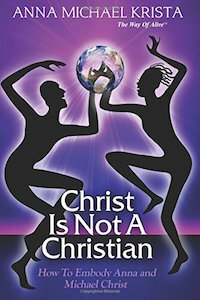 her bestseller, Christ Is Not A Christian – How to Embody Anna and Michael Christ. Love like a new puppy is the essential instruction for the full spiritual embodiment that Anna Michael Krista helps people to achieve. Everything you need to start feeling, sensing, talking to in your language, and being physically guided by I AM, your Creator parents, is in her book. The words that ring true to you in her book are the ones that will guide you. Anna Michael Krista pioneered this uncharted path the hard way, so that you don’t have to. Her role is to make you believe that this is possible, even though you and she are imperfect; and further, to believe that more than this is possible. She turns the mesmerizing stories of courage and Love in her arduous and adventurous spiritual journey into specific instructions so that you can radically upgrade your communication with I AM faster, simpler and with a lot more fun.